Washtenaw County’s first 2019 case of measles took place at the Early Childhood Center at Ann Arbor’s JCC. Washtenaw County has reported one confirmed case of the measles, a child at the Early Childhood Center at the Jewish Community Center of Ann Arbor. Peretz Hirshbein, director of child and family services at the JCC, said the child with measles just turned 1 and contracted it either just before or shortly after immunization. Hirshbein said families, including this family, are frustrated because they did everything they were supposed to do to protect their infants — who normally are not given the MMR vaccination before age 1 — but still their childcare center was affected. Hirshbein said there are about a dozen children at the center under age 1. For the next 22 days, according to Department of Health procedures, these children must stay away from the childcare center. Hirschbein added that ECC staff are advised to check their immunization records or receive a booster shot if they are unsure. The ECC may also have an onsite vaccination clinic Wednesday. Julie and Andrew Prussack are both physicians in Ann Arbor with a toddler and an infant. Julie said she is saddened that because of the broader measles outbreak, they decided three weeks ago not to take their infant daughter out of the house, including to Purim festivities. She is thankful to have parents and in-laws nearby who can stay at home with the baby. Her 2-year-old son attends daycare that is not located at the Ann Arbor JCC, but Julie is considering keeping him home for a while to avoid the risk. A “huge advocate” for vaccinations, she said she has accelerated the immunization schedules for both her children. Measles is a highly contagious disease that is transmitted through airborne means. The Washtenaw County Health Department is hosting walk-in vaccination clinics at 555 Towner St. in Ypsilanti from 5-7 p.m. Wednesday. 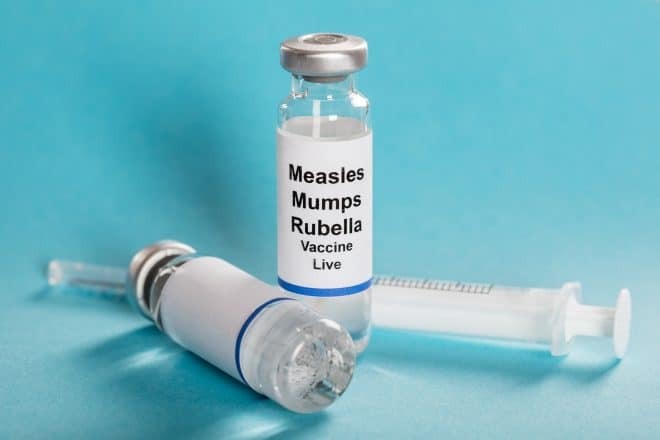 If you have Medicaid or Blue Cross Blue Shield insurance or are uninsured or under-insured and do not have proof of being vaccinated or having measles in the past, there will be no cost for the MMR vaccine. Bring your insurance card. If you have another form of private insurance, contact your healthcare provider for the vaccine. Anyone at any of the following Washtenaw County locations during the dates and times provided should monitor themselves for rash with fever or other symptoms consistent with measles for 21 days. If you suspect measles, seek immediate medical treatment. Residents are urged to call their doctor or emergency room before arriving so they can take precautions to prevent exposure to other individuals. Do not contact the businesses listed below for information. Jewish Community Center of Greater Ann Arbor, 2935 Birch Hollow Drive on April 1-4 and April 8 from 7:45 a.m. to 6:30 p.m. This includes families using the daycare program or individuals entering or exiting the facility. Olive Garden Italian Kitchen, 445 Eisenhower Parkway on April 1 from 5-7 p.m.
Liberty Athletic Club, 2975 W. Liberty Road on April 7 from 1-3:45 p.m. This includes individuals entering and exiting the facility and anyone using the pool or family locker room during the specified time. The Washtenaw health department in late March sent a detailed letter to all healthcare professionals alerting them of the outbreak in Oakland County. In 2017, Washtenaw County confirmed two cases of measles and exposure points at two Ann Arbor restaurants. In 2018, there were nine cases of measles in the county. According to the Michigan Department of Health and Human Services 2017 immunization waiver study, all children at the Ann Arbor Jewish Community Center Early Childhood Center were up to date on immunizations and no children had waivers. The same was reported at the Hebrew Day School of Ann Arbor. However, other private preschools and elementary schools in Ann Arbor had waiver rates as high as 10 percent. As the outbreak continues to grow — now reaching 41 confirmed cases, with 39 in Oakland County — the Oakland County Health Division stated on its website Monday it is working with schools and daycares to proactively identify unvaccinated or under vaccinated students who are at greatest risk of contracting measles. The Michigan Public Health Code Act 386 of 1978 allows school and/or local health department officials to exclude anyone who has a communicable disease or was exposed to the communicable disease and isn’t fully vaccinated against it. At Derby Middle School in Birmingham, a student has a confirmed case of the measles, according to a Free Press story, which also reported that Birmingham Public Schools administrators are following OCHD guidelines in requiring students who are not vaccinated and those who are under-vaccinated to stay home from school for 21 days after the date of exposure to try to limit spread of the measles. Review your child’s vaccination/medical history to ensure they have received two doses of MMR vaccine and the documentation is on file at school.